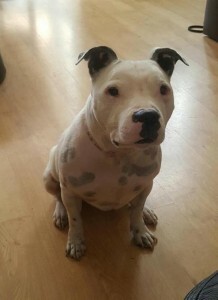 Meet Lulu the super cute little white Staffy girl! Lulu is 8, but still looks like a puppy! She is such a sweetheart who has had a terrible start to life, but is now having lots of TLC in a lovely foster home. Lulu can be very submissive and needs a gentle, quiet home where she can be given lots of love and shown that the world isn’t a bad place. She does love people and adores having lots of company and fuss. She is great around the house – she is housetrained, absolutely fine to be left for a few hours and is happy to sleep downstairs at night. 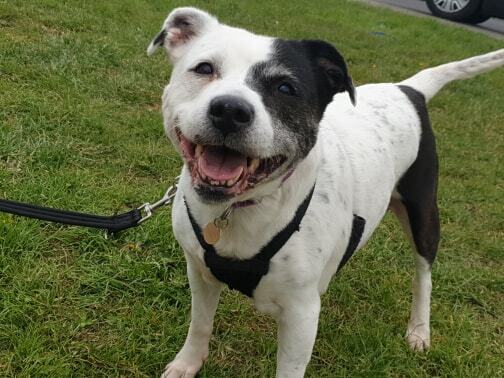 Lulu loves her walkies and walks nicely on the lead (she loves to have a run around too!). She does need to be the only pet in the home, but will ignore dogs as long as they ignore her on walks. Lulu travels very well in the car and really enjoys her trips out and about! She needs a home with older children (14+). Lulu deserves a 5* home where she will be spoilt rotten from now on after all that she’s been through. This entry was posted in Female, Happy Endings, Medium, Small by Amanda HYPS. Bookmark the permalink.